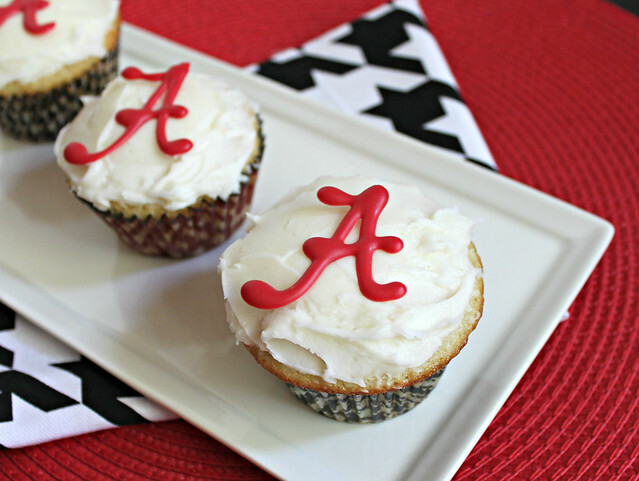 Southern Pink Lemonade: Classic Vanilla Cupcakes for the upcoming Alabama game, Roll Tide! 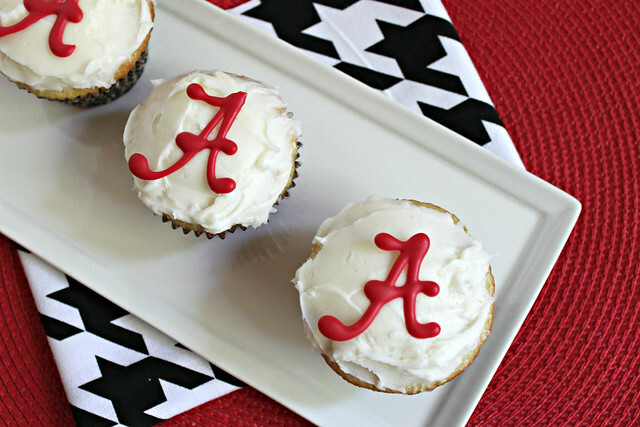 Classic Vanilla Cupcakes for the upcoming Alabama game, Roll Tide! This month has been quite busy. We were all prepared to move, but found out about two weeks before we were supposed to leave that we would be staying in Kansas for a little while longer. After canceling the movers, calling our landlord to tell them we were staying, and dealing with many other things that arose from us not moving home anymore, we are finally settling back into our routine. August and September are normally big months for us anyway, since Russell’s birthday is in August and college football normally starts in September. I was planning on being in Alabama and having some of our friends and family over for the game but since that didn’t happen it will just be Russell, Jake and I. Although it will only be the three of us watching the game this weekend, I have already planned a wonderful menu full of football food. We will also be having these cupcakes. I have posted a vanilla cupcake recipe a while back but this is definitely my new favorite. I have made it several times since I first discovered it a few weeks ago. Since Alabama’s colors are white and crimson, I wanted to make a vanilla cupcake with white buttercream frosting. I found some adorable houndstooth cupcake liners and as an Alabama fan, I couldn’t pass them up! I also wanted to add a little something to decorate the cupcakes with. I thought the Alabama “A” would be great. I found one online, copied and pasted it about 12 times into a word document, and printed it. I then melted some red candy melts with a little bit of coconut oil. 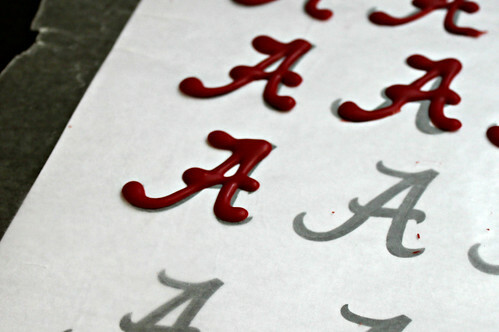 I placed the “A’s” that I printed out under some wax paper and traced the “A’s” with the melted red candy melts (I used a size 2 pipping tip). I think they turned out pretty well! Of course, these cupcakes are definitely customizable according to your to team loyalty. While piping the icing always looks pretty, I decided to once again just use a knife to ice the cupcakes. Russell isn’t a big fan of icing so it works out well. I halved the vanilla buttercream icing that is below since I knew I wouldn’t need as much but if you do plan on pipping the icing, I would definitely make the entire batch. Preheat oven to 350 degrees F. Line a 12-cup muffin tin with cupcake liners. Spray with non-stick spray. In another medium sized bowl, beat eggs for approximately 30 seconds. Add sugar and beat for another 30 seconds. Beat in oil and vanilla extract. Add half of the flour mixture to the sugar mixture and beat on low until just combined. Next add half of the buttermilk and once again beat on low until just combined. Use a spatula between each addition to scrape the sides of the bowl. Continue with the other half flour and then end with the rest of the buttermilk. Fill each muffin tin about 2/3 full. Bake for approximately 12-15 minutes. Allow to cool for 1 minute in the muffin tin. Then remove to a wire rack to continue cooling. Once cupcakes have cooled ice with vanilla buttercream. Using a stand mixer fitted with the whisk attachment, beat butter at medium-high speed until smooth, about 20 seconds. Add powdered sugar and salt. Beat at medium-low speed until most of the sugar is moistened, about 45 seconds. Scrape down the bowl and beat about 15 seconds at medium speed until the mixture is fully combines. Scrape the bowl once again and add vanilla extract and heavy cream. Beat for about 10 seconds until incorporated. Increase speed to medium-high speed and beat until light and fluffy. This will take about 4 minutes. Make sure to scrape the bowl once or twice during this time.